BALDA, the third Abbess of Jouarre (Abbaye Notre-Dame de Jouarre) in present-day north-central France. St. Balda reposed in the late seventh century and her relics were enshrined at the Abbey of Nesle-la-Reposte in the Champagne-Ardenne region. CYPRIAN, a monk at Périgueux, who ended his life as a hermit near the Dordogne River, where the present-day village of Saint-Cyprien, Dordogne is located. Saint Cyprian reposing in 586. St. Gregory of Tours (17th November) was the author of a biography of St. Cyprian. ENGUERRAMMUS (ANGILRAM the WISE), a monk and later Abbot of Saint-Riquier in Picardy. St. Enguerrammus reposed in 1045. ETHELGIVA (ÆTHELGIFU), a daughter of King St. Alfred the Great (26th October), St. Ethelgiva received monastic tonsure and lived a life of great sanctity, culminating in serving as the first Abbess of Shaftesbury. St. Ethelgiva reposed in 896. LEOCADIA (LOCAIE), a martyr in Toledo, who was condemned to death during the Diocletianic Persecution (circa 303), but miraculously died in prison before she could be tortured under Diocletian circa 303. 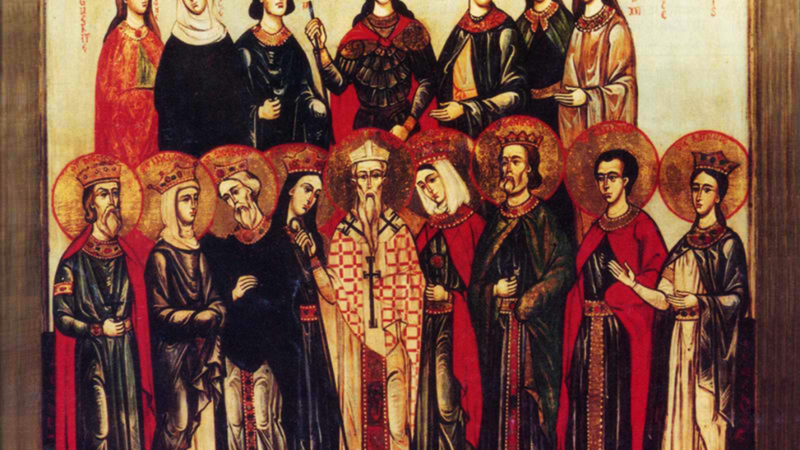 PETER, SUCCESSUS, BASSIAN, PRIMITIVUS, and COMPANIONS, (Date Unknown), aside from being listed in ancient martyrologies, nothing is known of the group of martyrs in North Africa. PROCULUS, an early Bishop of Verona. Though he suffered greatly for the Faith during the Diocletianic Persecution, St. Proculous reposed peacefully circa 320. RESTITUTUS, (Date Unknown), little is known of this saint, save he was a Bishop of Carthage, possibly a martyr, and a sermon in his honour was preached by St. Augustine of Hippo (28th August). However, any further information, including the sermon, is no longer extant. SYRUS, (First Century ? ), the first Bishop of Pavia in Lombardy. A tradition states he was appointed by the Apostles, and there is a legend that St. Syrus was the boy with the five loaves mentioned in John 6:9. VALERIA, said to have been converted by, and a spiritual daughter of, St. Martial of Limoges (30th June), martyred by beheading. It is highly likely her existence is apocryphal. WOLFEIUS, William of Worcester writes that St. Wolfeius was the first hermit of St. Benet Hulme in Norfolk, England. Nothing further is known of him, it is believed he reposed in the early eleventh century.